Although we never forget our heritage, Mountain Village and Telluride have certainly come a long way from its days as a sheep ranch and mining town, respectively, to being named one of the world’s top resort destinations. 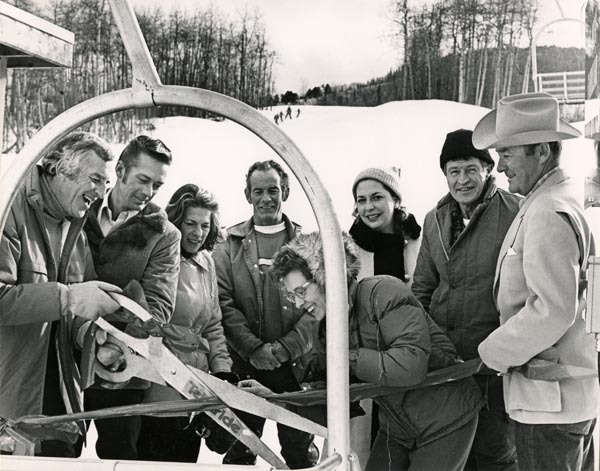 In 1968, entrepreneur Joe Zoline began to assemble the land needed to build a world class ski resort including Gorrono Ranch and Adams Ranch. With the purchase of the land, he then convinced the Town of Telluride and the United States Forest Service of his choice for the location of an “official winter sports site” in the present Mountain Village. Enlisting the expertise of former French world champion skier Emile Allais, Zoline planned to develop the ski resort in stages. In 1972, the first of the lifts and ski runs opened. In 1978, Ron Allred and Jim Wells purchased the Telluride Ski Resort from Zoline. Allred and Wells set out to create a pedestrian-friendly, European-style resort village above the Town of Telluride on 3.5 square miles of land that was then sheep ranches. Their vision included a commercial center that is known today as Mountain Village Center (or to some, Village Core), single-family estates dispersed carefully within the natural landscape, and a meandering network of winter and summer trails, walking paths, and golf fairways throughout. Their original vision also included housing for the local workforce and civic amenities to support a small, but thriving, year-round community. San Miguel County approved the Mountain Village Planned Unit Development December 22, 1981. Allred and Wells knew it would be necessary to pay for the installation, operation and maintenance of the essential infrastructure. Thus, the Mountain Village Metropolitan District (MVMD) was established in 1983 for the purpose of collecting property taxes and providing services and amenities for health, safety and welfare. Such services and amenities included water, drainage, public parks and recreational facilities, roads, transportation and wastewater treatment. MVMD was essentially the local government of the community. Then in 1984 Mountain Village Metropolitan Services, now known as Telluride Mountain Village Owners Association (TMVOA), was established to be a master homeowners association. This entity was responsible for the aesthetics of Mountain Village and continues to be responsible for the ongoing operational and maintenance costs of the gondola system which is funded by TMVOA’s Real Estate Transfer Assessment (RETA). As TMVOA’s largest revenue stream, RETA is assessed at a rate of three percent on certain real estate transactions. A decade later, it was evident that Mountain Village was no longer just a “company town” supporting the building and development of a world-class resort community – it was a world-class resort community. The Town of Mountain Village was incorporated in 1995, and gradually took over the functions of MVMD which was formally dissolved in 2007, the same year that the town separated from TMVOA.